Written by George Broderick, Jr. 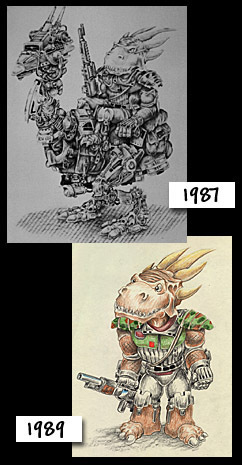 In 1987, he was just an unnamed reptilian character in one of my many untitled pencil drawings. That all changed...3 years later...when I was contacted by Innovation Publishing to create a B/W, 3-issue comic mini-series that would feature many of my bizarre and fantastic characters. Seeing that my pencil drawing style was so dark, Innovation decided that inking over my work was unnecessary. My pencil shading and textures would be retained. When I needed to darken a large area of a panel, I used an airbrush. 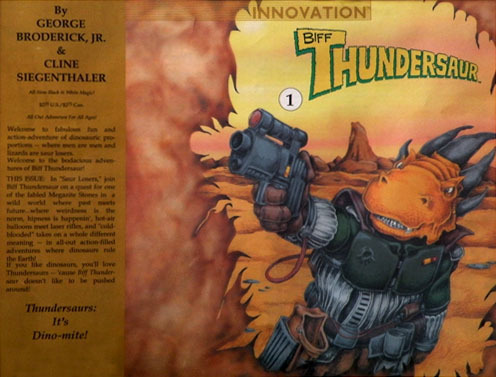 BIFF THUNDERSAUR #1 premiered in May, 1991. Unfortunately, in the course of production, the idea of the mini-series was scrapped. Biff Thundersaur became a one-shot (with the potential for future issues). The first issue was well received, but Innovation began moving towards larger, movie-related projects, and no more issues of "Biff" were planned. I acquired as many issues as I could and continued to sell them at comic book conventions. In 1994, Innovation Publishing closed down and I purchased the remaining rights to the book.